As my friend Tony Garmey says: “Boys need not apply”. 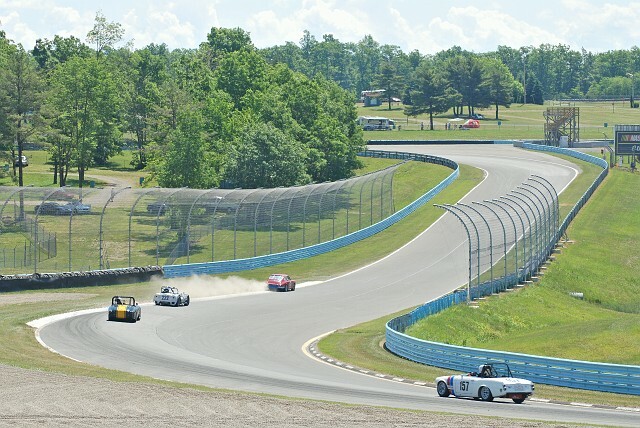 Lots of pucker factor at the Glen. It’s easy to wad your car up into a little ball, as numerous people did this weekend. It was a strange event – HSR is really weird. At least half the cars on the track were modern, some of them the current year!! In the GTP class, there was an Audi A8 that raced at Le Mans two years ago and the Bentley GTP car that won in 2005. They combined my group (2) with group 3 which had a fleet of 914-6 Porsches on big slicks and 300+ HP motors, lots of 911s and sports racers. Interesting group. The track is very fast, and there are Armco barriers everywhere. There’s a twisting uphill left followed by a funnel of Armco leading over a bridge that drops to the right. You have to thread the needle and make the apexes flat out in top gear. Interesting. Yeah, that’s the word I’m looking for: Interesting. I’m saving “Terrifying” for Mosport. More on that later. Very impressive track and a nice funky town. Lots of history in this town, but it doesn’t quite have the close integration of track and town that you see between Road America and Elkhart Lake. Still, there’s definitely a racer scene at the Seneca Lodge bar. We went Friday night and it was packed with the usual set of geezers with greasy nails, talking racing. Diane and I camped at the track in Nero, stuck out in the boonies a bit because we wanted power for the air conditioner. It was 95 during the day and stayed pretty warm at night, so the refrigerated air was a big deal. The paddock marshal actually directed us to a good, centrally located site that had power, but an official from the track came by and told us we couldn’t paddock there–reserved camping, he said. Of course, the twenty or so spaces stayed completely empty throughout the weekend, but I’m sure he felt good about his job performance giving us the boot. 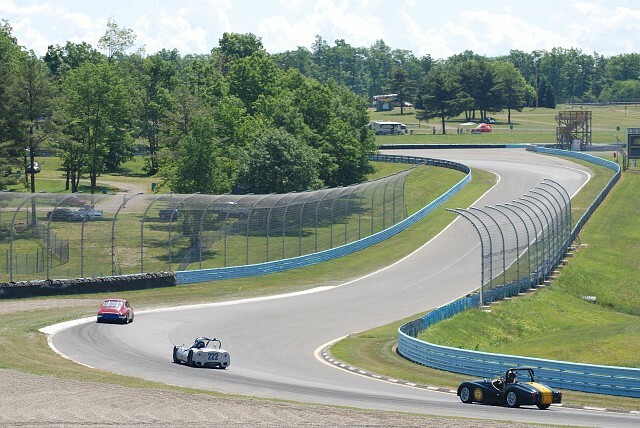 Watkins Glen is a tough track. Not particularly hard to learn–I had the general direction of the turns down pretty quickly–but to be fast you have to really hustle the car through some turns that would definitely not forgive errors. The most intimidating turn for me was the little bend just before you go over the bridge. The Armco funnels down as you cross the bridge, and both the left bend and the right turn before it are flat out in top gear. But of course, you have to hit the apex perfectly to thread the needle on the bridge, and then there’s another downhill right onto the back straight that’s hardly a turn except in Peyote I was going 125 MPH as I negotiated it and drifted to the outer edge of the straight. I did the test and tune day on Thursday, and was progressing reasonably on lap times, getting down to about 2:29 by mid-afternoon. The sports racers and faster Porsches were screaming past, but I used them to guide me through a turn or two, learning their lines. By the end of the day I was staying in touch with them through the turns–they still disappeared down the straights. Friday in practice I saw what most of the competition was on–full slicks! So I took off my worn out Speedsters and put on my DOT radials. No point in taking a knife to a gun fight. I pulled out a 2:21: something on Friday morning, the best time I managed all weekend. As I said in the previous post, HSR is a run-what-you-brung organization, and even though people say SVRA (same company owns it) is more strict, I think those a pretty relative terms. 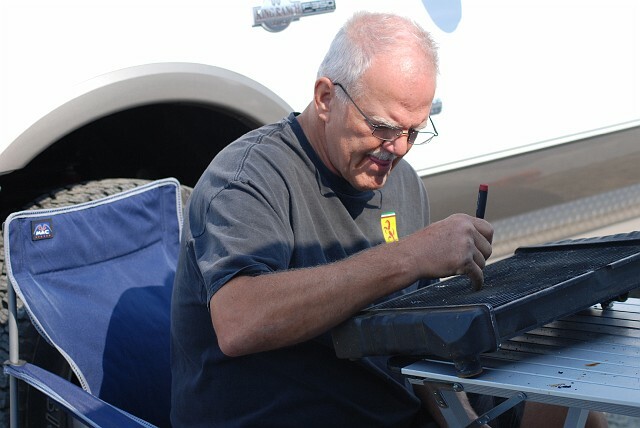 Many of the cars that run here wouldn’t be accepted by any West Coast organization except SCCA Vintage. It’s not surprising that you don’t see many great vintage cars here–no point in taking your five million buck Ferrari to a race with 300 horsepower 914-6’s with flares and huge slicks. Peyote was in Group 2 which was running with the “historic” cars in group 3. In some cases, I think “historic” meant it was running in SCCA last year. After the first qualifying practice on Saturday, I was second in group 2 and 23rd overall in the 48 car field. Not too bad for the new guy. I had hopes to move up a bit. During the qualifying race on Saturday I finished first in group 2, and 20th overall, but my time had slipped backward about 1.5 seconds to 2:22: something. Traffic. 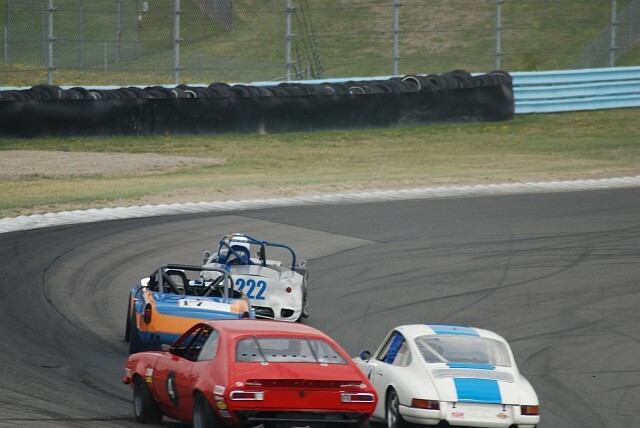 One of the faster 914-6’s hit the wall at the entry to the straight. Wadded the car up, probably hit at close to 100 mph. The driver was fine but the car looks done–wadded into a square package about 1/3 the length of the original car. Saturday night there was a barbeque on the lake in the town of Watkins Glen. Nice evening and really good food. We were going to go back to the Seneca Lodge but both Diane and I were too sleepy. Wobbled back to the track and crashed in Nero. Sunday my race wasn’t until 3:30, which was a good thing since I found a little radiator leak. I put an electric cooling fan on the radiator last year, using those plastic push-through mounts. That might work OK for a street car, but I developed a small leak at one mount. I spent the morning repairing it with a little JB weld and delicately restoring all the bent fins in the radiator. Got it all buttoned up and ready to go in plenty of time, so I spent the rest of the time getting the trailer prepped to go. Time to RACE! I was gridded 20th, got a great start and went right up the outside of the pack, entering the first turn in about 8th. I got down through the esses without losing a place, across the bridge, onto the back straight and a bunch of 911’s went blasting by. Got passed by a very fast TR4 (can’t remember the guy’s name–excellent driver) at the entrance to the bus stop chicane, repassed him in the heel of the boot, came up the hill to the front straight turns and BAM, something popped in the engine room, sending steam everywhere. I lifted and looked at the temp and oil gauges. Oil was fine, temp at 230, so I limped to the pit entrance and exited the track. Turns out that my screwball mechanic left the high point vent on the cooling system finger tight. What a moron. Got to fire that clown. I filled up the cooling system after everything cooled down a bit, idled back to the paddock, checked the compression–looks okay. So I’m probably OK for Mosport. Packed up and hit the road. We drove along Lake Seneca to the town of Seneca looking for dinner. Didn’t find anything promising so we wound up eating at a family restaurant near the highway. The menu was surprisingly ambitious and the food was decent. 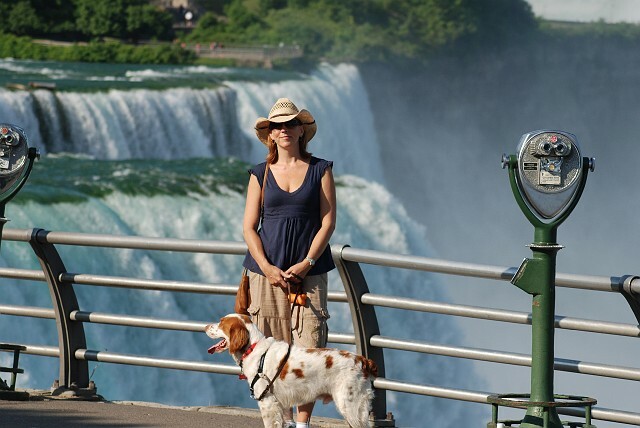 We drove along Lake Ontario looking for a motel or a campsite–nada. So we took the navigation systems cue and tried a hotel in a nearby town called the Hamlin Inn. When Diane was talking to them they seemed a little shocked that anyone would be calling about availability. She also asked if they had nearby parking for our long trailer. After some consultation that sounded like a comedy routine from my end, they decided that there would indeed be adequate parking. So we drove the six-mile detour to Hamlin and located the Inn. From the motorcycles parked outside and the crowd of locals drinking beer and hooting on the front porch it was clear that while we might have found a bar I would enjoy, we had not found reasonable accommodations. We traveled on down a two-lane country highway, with me nodding and biting the inside of my cheek to stay awake. We finally found a basic roadside rest area with a sign that simply said “Parking, 1/4 mile”. It was quiet and a long way from any civilization, so I convinced Diane it would be perfect. And indeed it was. 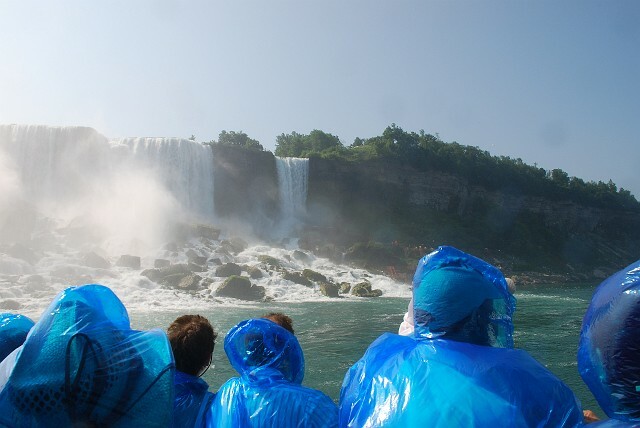 We slept well and continued to Niagra Falls in the morning. Nero is actually great to sleep in. Quiet and comfortable, the bed is very nice with a layer of Tempurpedic foam on top of the standard foam to support seating. 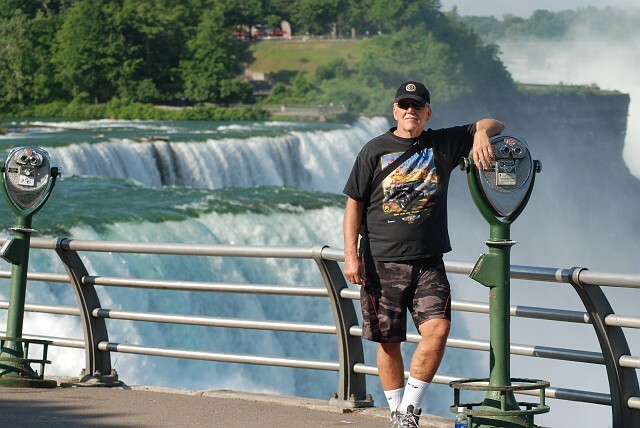 Niagra was fun. 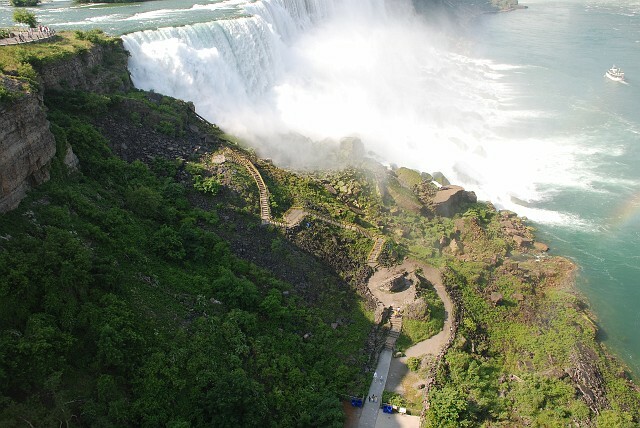 We walked along the cliff top to American Falls, took some pictures, then took the elevator down to the Maid of the Mist to see the falls close up. Neat experience. 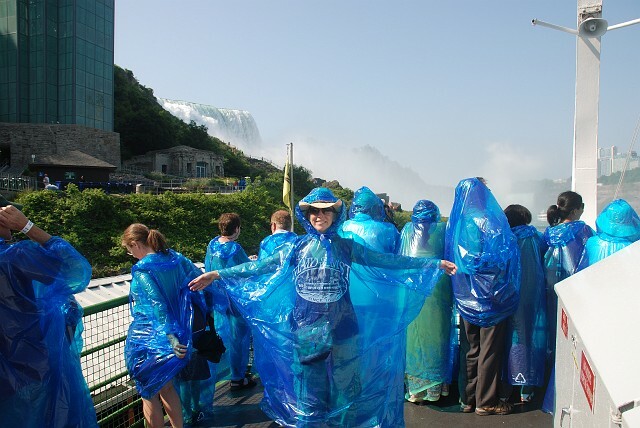 Surrounded on all sides by Chinese and Indian tourist, we stood in our genuine recyclable plastic ponchos and watched a million tons of water pour down. Very worthwhile. Then we hopped back in the car and made out way through customs. They have a special line for RVs and busses in customs, but we were the only ones there, so we bypassed the hordes of cars and got our own inspector, a young kid who was much, much more interested in Peyote and my FZ1 Yamaha than anything else. I could have had a bale of Marijuana in Nero and he wouldn’t have glanced at it. Boys will be boys. So customs was painless. My navigation system is clueless about Canada. I’ll get a card for it when I have an opportunity, but for now, according to the GPS screen, we are floating in space with an occasional road nearby. We stopped for lunch in Burlington, west of Toronto, and had a spectacular meal at a restaurant called Pepperwoods. It’s been so long since we’ve had careful cooking and skillful use of good ingredients we ordered a huge medley of appetizers–way too much–and got to-go boxes. We went for a walk to take the edge off the stuffed feeling and found a Belgian chocolate shop where a charming Belgian lady and her son who owns the business, hand make spectacular chocolates and offer excellent coffee. We couldn’t pass that up, so we got some to put in the refrigerator, even though we know it compromises the beauty of the chocolate, it doesn’t affect the taste much. We made it to Mosport about 4:00, had to wait until 5:30 for the track to clear so we could cross it (Nero won’t fit through the tunnel) and we got one of the few spots with adequate power. We spent a comfortable night in Nero and headed off to explore. We don’t need to be back to the track until Thursday morning (though we’ll get there Wednesday night just to be certain). We decided to go to Rice Lake, a large lake about fifty miles from Mosport. On the way, we stopped for a late breakfast in Port Hope. Turns out there’s no nice funky little breakfast place in Port Hope but there’s a couple of good lunch spots. One called Zest opened at 11:30 and the menu looked nice, so we walked around the town awhile and had lunch there. Excellent Nicoise salad, a really good bottle of Provencal rose to suit the warm weather, and of course some frites, since we’re in Canada. Everything was wonderful. We continued on to Rice Lake and a lovely place called the Victoria Inn. Classic old home converted to a nice Inn, right on the lake. Canoes, swimming pool, lovely dining room, etc. Spent a nice afternoon. 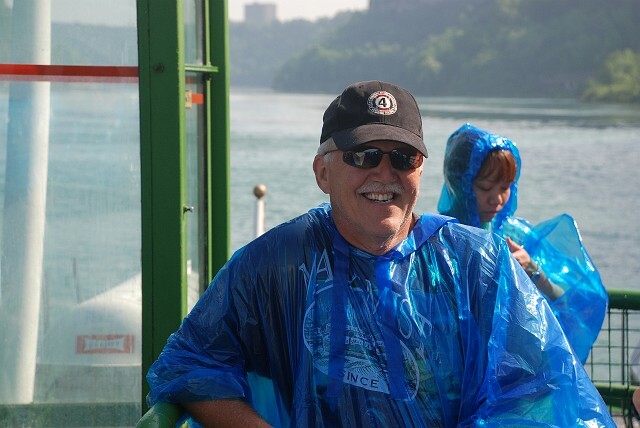 I had a minor disaster with a canoe in the high wind–it wanted to blow away with me in it. Only some fairly frantic paddling and getting close to the trees got me back to the wharf. I fell in while I was launching it, providing no end of mirth to Diane. Had a nice meal, a post-prandial stroll along the lake. talked to a few fisherfolks, and back to the Inn in the twilight. Very classical and relaxing. So now to bed. Tell Diane we need documentation of events like you falling in…she needs to have that camera ready.